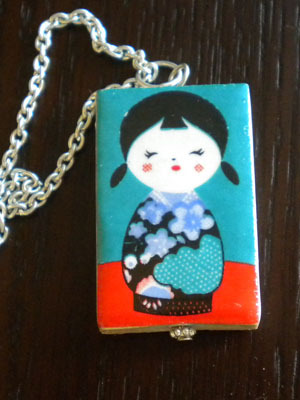 I just fell in love with this little Japanese Girl Pendant my daughter picked up for me from Forever 21. I know they have cute stuff, I was not quite sure they have jewelry that will appeal to me. She said it reminded her of me ( I must have looked like this at one point in my life 🙂 It is I think painted on ceramic and hangs on a silver color chain. And, Rice bag! (Idea # 7). I was so excited when I found this bag sitting on the shelf of my pantry. I did not remember buying it. 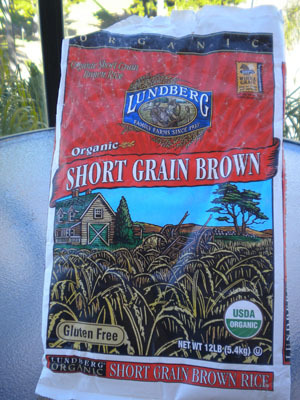 Organic brown rice? It turned out that my daughter Lyra has gone organic on me 🙂 I don’t mind as long as they come in pretty bags like this. So, I will get busy today cutting them up and rolling them into beads and then we will see which one will be a match for Little Bochi necklace. 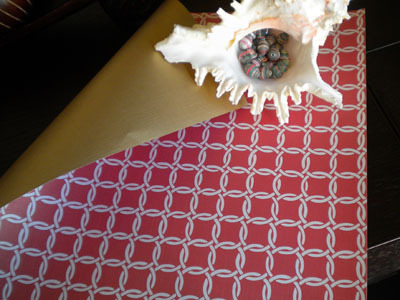 Upcoming Posts: Poster Paper Bracelet, Turquoise Jewelry, Guess Black Paper Bag. 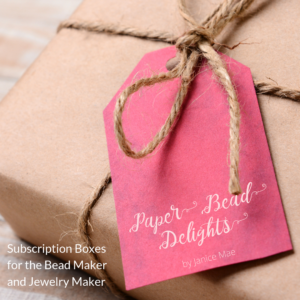 Paper Bead Trade Update: The necklace kits for the Fall Trade has been mailed. Yay! Too Cute! Can’t wait to see the beads!